Frederick Gallagher Galleghan was born on 11 January 1897 in Jesmond, a suburb of Newcastle, in New South Wales. Of West Indian extraction, his dark complexion would in later life lead to his nickname of “Black Jack”. As a school boy he had a keen interest in the military and joined the Cadets. After completing his schooling, he began working in the postal service as a telegraph messenger in 1912. During WWI, Galleghan volunteered for the Australian Imperial Force (AIF) and fought in France for over two years. In October 1940, Galleghan was appointed commander of the newly formed 2/30th Battalion, part of 27th Brigade of to 8th Division. Galleghan, a strict disciplinarian, had high expectations of his battalion and accordingly implemented a rigorous training program. The aim to defend Malaya and Singapore, however, became a disaster. The whole Allied army was taken prisoner. Imprisoned at Changi with the remainder of the captured Allied soldiers, Galleghan became commander of the Australian prisoners following the departure of Major General Cecil Callaghan in August 1942, and from 1944 was deputy commander of all Allied prisoners in Malaya. Galleghan applied his renowned standards of discipline to his charges during imprisonment in order to maintain morale and the prisoners’ wellbeing. Changi was relieved by the Allied forces in August 1945 and two months later, Galleghan returned to Australia. Galleghan returned to his investigative work in Sydney and the following year was recognized for his leadership during the imprisonment at Changi with an appointment as an Officer of the Order of the British Empire. He was made an honorary major general in 1948, and for nearly two years, he was in charge of the Australian Military Mission to Germany. Once his duties in Europe were completed, he became involved in refugee work. Galleghan retired from public service in 1959. Even in retired life, he continued his involvement with charitable organisations and was knighted in 1969 for his work with war veterans. He died on 20 April 1971 at his home in Mosman, New South Wales. He was survived by his second wife, Persia Elspbeth Porter, whom he had married in 1969. Neither of his two marriages resulted in children. 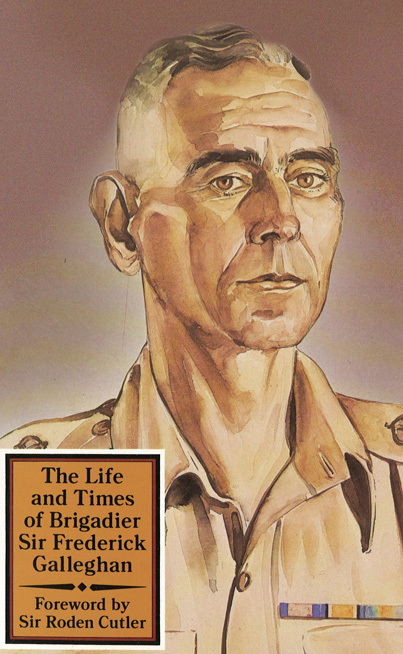 The colourful portrait that Henk Brouwer made of Gallaghan, is used as cover image of The Life and Times of Brigadier Sir Frederick Gallaghan, by S.F. Arneil (1983). The location of the portrait is yet unknown, so if you have a clue, please contact us.